LEFEBVRE, JEAN, merchant and entrepreneur; b. 1714 in the Pays de Caux, France; d. 1760. Jean Lefebvre first set foot in Canada in 1732. He was only 18 and had come to act as assistant to his cousin François Havy, who was to be Quebec factor for Robert Dugard et Cie of Rouen, France. Like his cousin, Lefebvre was a Huguenot; the law forbade his settling in Canada with wife and family. But few metropolitan agents, Protestant or Catholic, ever expected to stay at Quebec for very long, so this restriction could not have weighed on his mind. A young, aspiring merchant submitted to the exile of colonial life to learn his trade and earn enough money to set up business in one of the French Atlantic ports. Lefebvre was no doubt resigned to passing some nine or ten years at Quebec, but he could not have imagined that it would be 28 long years before he would leave it for the last time or that he would then look at it, a heap of rubble, from the rail of an English warship. 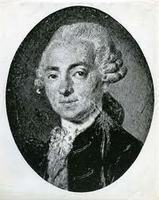 In 1734 Lefebvre became the junior member in a partnership with François Havy. Henceforth they shared a collective responsibility in business and signed their accounts jointly, “Havy et Lefebvre.” Their primary interest was their annual trade for Dugard et Cie, for whom they handled 13 major incoming cargoes and 14 return cargoes. They also built the company six ships, making a significant contribution to the growth of Canadian industry. But between 1743 and 1748 Atlantic storms and English privateers combined to destroy most of the company’s fleet, forcing it to abandon the Canada trade. Havy and Lefebvre were left to their own not inconsiderable resources. Beginning in 1737, they had acquired interests in sealing stations on the north shore of the St Lawrence at Mingan and on the coast of Labrador at Grand Saint Modet, Chateau Bay, and Baie des Esquimaux (probably Hamilton Inlet). They also became directly involved in the fur trade by joining a company that leased the King’s Posts from 1749 to 1755. Their import-export trade with France and the West Indies was continued, and Havy and Lefebvre became money-lenders as well. The Seven Years’ War separated the two partners. Under war-time conditions, the successful continuation of their business necessitated Havy’s removal to La Rochelle, France, while Lefebvre remained at Quebec with yet another cousin, François Levesque. In 1758 the invasion of Canada began; Jean Lefebvre wrote his will, “considering that Nothing is more Certain than death and Nothing more Uncertain than its hour.” The massive destructions of the war and the collapse of the French empire in America destroyed what he and Havy had built up over 30 years. Sometime in October 1760, leaving the Canadian business in the hands of his agent Levesque, Lefebvre boarded the Trident bound for Portsmouth, England; from there he would make his way to La Rochelle to join Havy. An unexplained accident intervened, however; and he did not live to see his partner again. Lefebvre was only 46 when he died and he had never married. He had made a valuable contribution to the struggling colonial economy, which had repaid him with a measure of wealth and status. That war and accident should so cut short his enjoyment of them must give to his life, in retrospect, the appearance of along preparation for a future that never happened. Dale Miquelon, “LEFEBVRE, JEAN,” in Dictionary of Canadian Biography, vol. 3, University of Toronto/Université Laval, 2003–, accessed April 24, 2019, http://www.biographi.ca/en/bio/lefebvre_jean_3E.html.